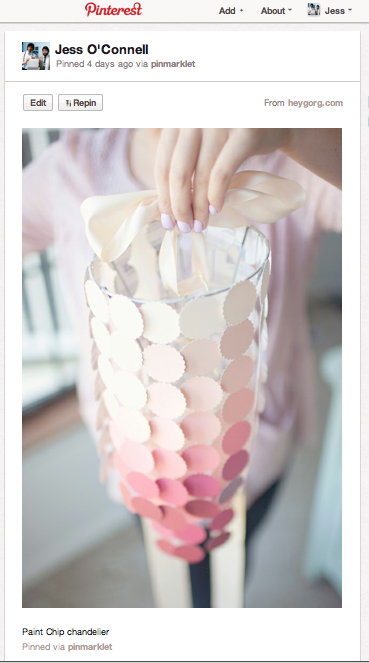 I am constantly inspired by YHL, including their Pinterest Challenge earlier this summer. I am constantly pinning new things, and so are my fellow May 2011 Knotties, so I proposed a Challenge. Stop Pinning, and start doing. The deadline was today to complete. We have a really ugly light fixture in the dining room, and I was looking for a non-permenant fix, that also brought in more yellow. We went to Lowes and procured as many yellow paint chips as possible. Then we got a paper punch from Michaels and got punching! And after trying to figure out the best way to attach them (Needle and thread, twine or wire) we layed them out in a pattern and taped the thread to the back. Then we stuck another circle on the other side so you didn't see the backs. We tied the strings to a circular wire ring, and hung it over the old light fixture. Seriously, come over and decorate my place! Very cool! That turned out great!